Recently I wrote an article here on the blog comparing and contrasting live streaming platforms to help people make some informed choices on which platform to consider between Facebook Live and Periscope for different types of strategies. It’s a solid piece if I do say so myself and I enlisted 4 people in the social media / entrepreneurial game I respect to include their take. 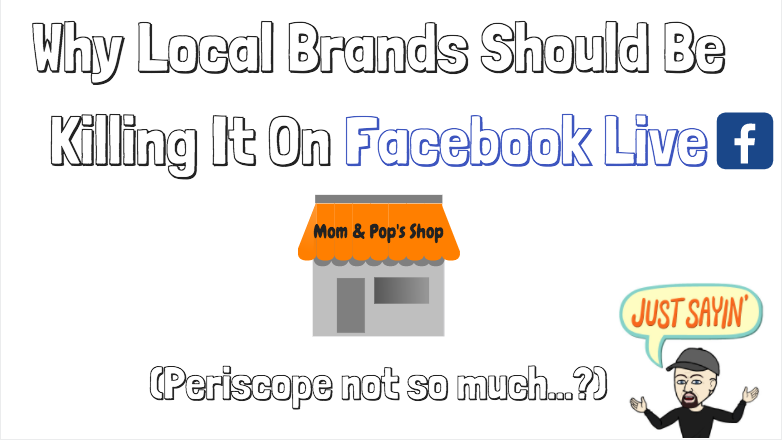 That article is still on point and relevant, but this is basically a part 2 digging into a main advantage Facebook Live has for local brands. I’m seeing more and more jarring evidence lately that points to Facebook Live as the best opportunity for small businesses and especially brick and mortars that operate mostly on a local level like us. Now to be clear, here at Frameable Faces we are NOT planning on “switching” to Facebook Live from Periscope overall. Periscope is still our first love for live streaming and our favorite especially for our Doug & Ally Morning Show that we start most of our days with. We don’t have plans to change that. 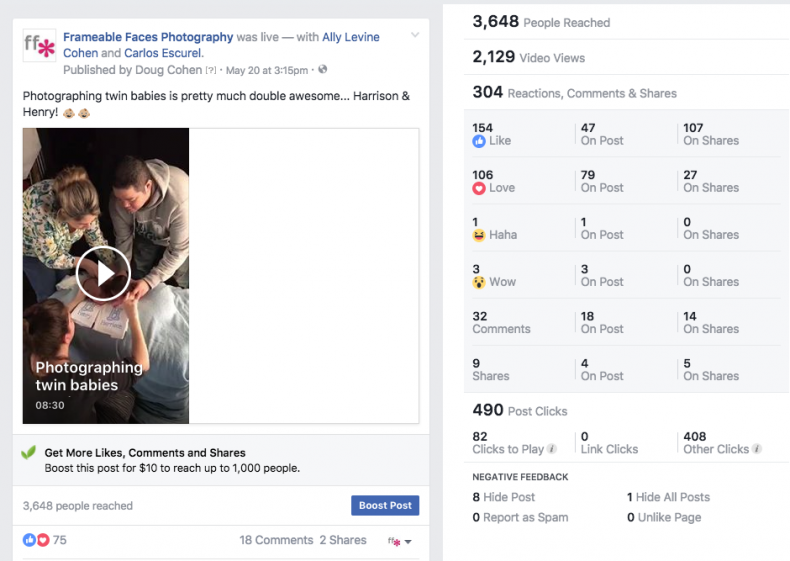 But something happened this past Saturday that cannot be ignored as an obvious example of why Facebook Live is starting to pull ahead for our strategy as a photography studio as opposed to morning show hosts. Saturday we did a photo session here in the studio for twin one month old babies. The article with sneak peeks from that session will be available here on the blog soon. We did a bit of live streaming of the session and it was just cuteness overload! We’ve had plenty of babies in the studio and plenty of twins, but never twin babies! We started with Periscope and we even mentioned to our Periscope community earlier in the morning that we might go live in the afternoon with twin babies. One more sidenote – as you can see above the thumbnail (the representative image from the broadcast) is me with a relatively silly face. NOT the amazingly cute twin babies from the broadcast. I have pointed out how important it is to be able to choose a custom thumbnail to the Periscope team but they haven’t made this a priority. We then went live on Facebook Live right after the Periscope broadcast for 8 minutes and 29 seconds. There were maybe 5 – 10 people who tuned in to watch live. There weren’t many live comments if any… Granted we don’t broadcast on Facebook Live often or at regular times which can contribute to a small live audience, plus there are delays on the comments and it’s not as fun of an experience on Facebook. BUT….. I tagged Carlos (the dad) in the post who then shared the post and tagged me and his wife Gina in the post (he only tagged me and not Ally and me him and not Gina because he and I did the FB friending exchange) and then I went back and tagged Ally in the post, and then all his friends started to see the post in their feed, and a few of them shared the post, and then more people saw the post, and more and more people liked the post, which Facebook likes, so Facebook showed it to more people, and then a few more of those people shared the post, and so more people saw the post and they liked (and loved, and haha’d, and wow’d) the post and commented on the post and Facebook liked that even more so Facebook showed it to even more people and pretty soon the video had reached 3648 people and 2129 people watched it. Oh and there’s definitely a chance some people watched it because I chose an image of Harrison and Henry surrounded by Ally and their parents to represent the broadcast as you can see below (as opposed to just my face with a weird expression which I didn’t choose). When a Periscope broadcast ends it just sort of fades into the distance of the feed of ended broadcasts… When a Facebook broadcast ends that’s when it starts to get going if it’s worthy of watching. In the case of Harrison and Henry boy did it get going…. let’s look at a few more stats which Facebook provides in about 200 different ways, sliced and diced – more information than you would know what to do with about the demographics of who watched – age, gender and a lot more. With Periscope you have to use third party apps like Fullscope or Eggdrp (both great by the way) to get any analytics worth a darn. Now check THIS out. Here’s a visual representation of the viral nature of a really good Facebook Live video that I described in my run on sentence above (which was done purposely for emphasis haha). This broadcast was the only one in the time frame of this graph. Note how the views climbed on the third and fourth days… the broadcast was on Saturday May 20th, but on Tuesday May 23rd 653 people watched it! You can see it spreading and the buzz growing! But wait there’s more…. Remember the emphasis in the title of this article is on local brands right? 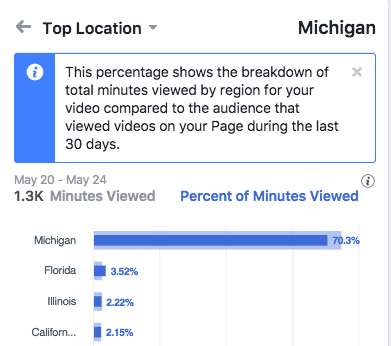 This graphic shows me that 70.3% of the total minutes viewed of this video were viewed in MICHIGAN. Our studio is IN Michigan. This is the core of our target market for studio portraits from a practical standpoint. That’s who we’re reaching on Facebook – lots of potential clients who are friends of Carlos & Gina and friends of friends of Carlos & Gina. We have a physical storefront where we take pictures and it’s in West Bloomfield, MICHIGAN. On Periscope our audiences are 10% from Michigan at best and that’s probably very generous, not that there’s any data anywhere that tells me this conclusively. Now once again – that’s fine – we love our international community and the friends we’ve made around the world on Periscope – that’s part of what’s amazing about Periscope. We’ve traveled to photograph people we’ve met on Periscope which has been amazing and we’re even expanding our photo restoration business to clients on Periscope which isn’t bound by geography. But if I’m advising a new local brick and mortar store on where to start broadcasting live and build community to get more people showing up at their door and becoming clients, I’m recommending Facebook first. I’m not saying don’t do Periscope per se, but if I’m picking one it’s Facebook. If I’m recommending a platform primarily to see the world, and have an amazing time for entertainment purposes and making new friends from everywhere, I’m still recommending Periscope. 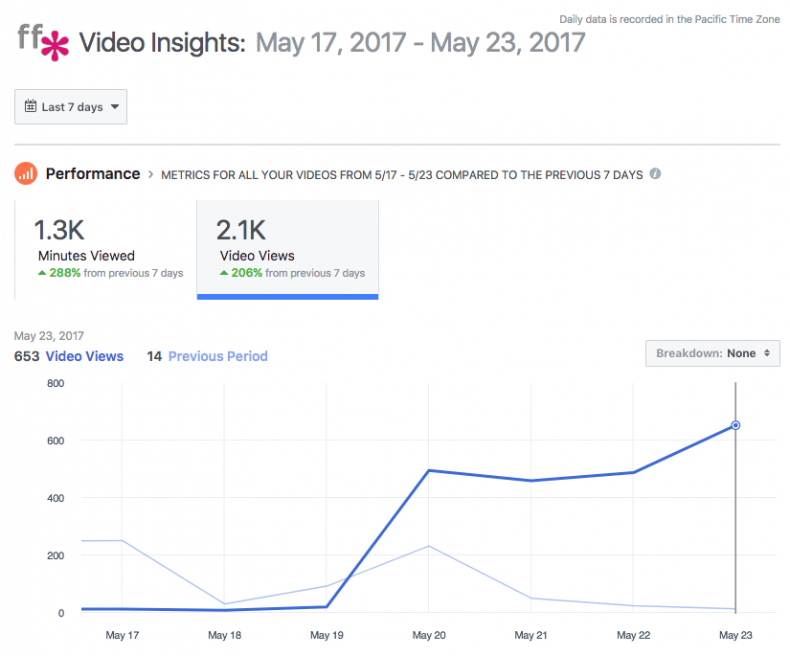 Since we started broadcasting on Facebook (which we made a part of our strategy well after Periscope) we have more people saying “Hey I saw you guys doing one of your live uh…video things – like online! Looks like fun!” And I always would ask “Oh cool! On Periscope?” and they would say “On what?” and then I would say “Oh wait maybe you saw us on Facebook (remembering that yes we go live on Facebook now too)” and then they would say “RIGHT! Yeah I saw you on Facebook!” You know why they say that? Because EVERYONE IS ON FACEBOOK. Some are on Twitter where you can also catch Periscope broadcasts but not nearly as many and fewer still are actually on the Periscope app. When we started broadcasting on Periscope on March 31st, 2015 it wasn’t long before we were sure that within a year or two everyone would be on Periscope because it’s that amazing. Well we still think it’s amazing – we were right about that. But shockingly to us most people walking around on the street – the people we want to walk into our mall and into our store – yeah those people – still don’t know what it is. Frameable Faces Photography is a small biz retail mom & pop shop of Doug&Ally Cohen located in the Orchard Mall in West Bloomfield, Michigan, United States Of America! Being “Frameable” is an attitude, a community, a way of life – a life you would want to celebrate and display on your walls for all to see! Tell us… ARE YOU FRAMEABLE? Join the Frameable Faces Community – sign up for our email newsletter for the best of the week in the Frameable Faces World! Click here!